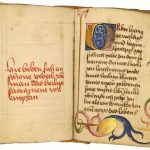 GERMAN PRAYERBOOK. 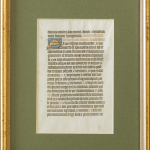 Illuminated manuscript on vellum. C15th, Germany (Rhineland, poss. Cologne). Small octavo, 9.8 x 7.4 cm. (writing-space 6.5 x 4.3 cm. ), 197 leaves (5 blank), fols. [i–xvi]8 [xvii]7 (of 8, [fol. [xvii]2 lost or cancelled) [xviii]–[xxiii]8 [xxiv]6 (of 8, 2 blanks cancelled at end) [xxv]8, plus two flyleaves cut from a thirteenth-century manuscript. 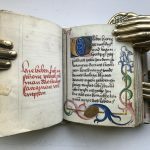 13 lines to a page, written in dark brown ink in a German cursive bookhand, rubrics in dark red, capitals touched in red, flourished initials in red and blue sometimes with contrasting penwork, five large illuminated initials with floral borders, 8 lines high on fol. 1 (somewhat rubbed), 3 lines high on fol. 5, and 4 lines high on fols. 16 (with parrot in border), 121 (with peacock in border) and 147 (with deer in border), scrolling borders, in the Rhineland style of the Göttingen Model Book. 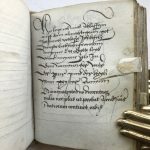 Four vellum navigation-tabs. 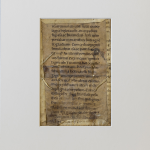 Extremities of some borders cropped, worn and rubbed especially towards beginning, bound in modern vellum over wooden boards with metal fittings and corner-pieces in a fifteenth-century style, paper end leaves. 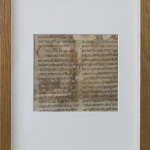 LATIN MS.. Romanesque leaf fragment from the Vulgate, decorated ms. on parchment. France, (probably northern France), late eleventh century. Substantial cutting from a single column of a large two-column Bible, with 25 lines in black ink in a late Carolingian bookhand, with the test of Abraham, Genesis 22: 4-14, one large initial “H” in red penwork and red penwork running title “Genesis”, reused in fifteenth- or sixteenth-century on a binding and thus with some folds, scuffs and areas of discolouration. Mounted. 9 x 6 23 x 15 cm. This is a fine fragment of a once vast and elegant early medieval Bible. 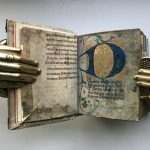 It is doubtless the only remnant of this medieval book to survive to modern times, and did so as it was set aside in the later Middle Ages in favour of more modern manuscript copies, and ultimately cut up and reused to form the binding of another book at the end of the Middle Ages. 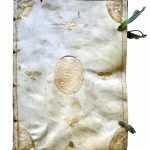 Manuscripts from the eleventh century are of exceeding rarity on the market, and even fragments are now few and far between. LATIN MS. Romanesque leaf fragment from the Liber Passionalis sive Historia Sanctorum, decorated ms. on parchment. Substantial cutting from a very large Romanesque manuscript, 21,5 cm. by 21,5 cm., with remains of two columns with 18 lines remaining in a fine and rounded late Carolingian bookhand, small initials, chapter numbers and rubrics in red, one large initial “B” in red penwork “bolted” together at its extremities by drawings of bands containing small circles, infill of early white-vine decoration on pale wash green and blue grounds, recovered from reuse in a fifteenth- or sixteenth-century bookbinding and so with folds, small stains and a hole (now professionally repaired). Framed and glazed (46 x 36 cm). This is an appealing early leaf of a date which is hard to now find on the market. The use of soft colour washes echoes that of the initials and line-drawn miniatures of a complete twelfth-century German Legendary, sold by Sotheby’s, 2 July 2013, lot 49, for £450,000 hammer, but it is perhaps closest in its ‘bolted’ banding of the body of its initial to a white-vine initial on a leaf offered by Sotheby’s, 3 December 2008, lot 5 (there identified as Austrian and twelfth century; and now in a 22 European private collection) as well as other contemporary Austrian examples (see F. Avril & C. Rabel, Manuscrits enluminés d’origine germanique, 1995, no. 122, pl. cxv). 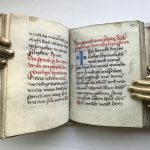 The parent book of this striking fragment would have been central to the life of the monastery or community it belonged to in the Early Middle Ages – containing the lives of the saints most sacred to the community. This part contains that of St. Leonard of Noblac, who was a Frankish noble (perhaps a royal) during the reign of the Merovingian king, Clovis I (the founder of the Merovingian dynasty, and the “clodouei regis” three lines below the initial here). He converted to Christianity alongside Clovis in 496, and after declining a bishopric, he became a hermit in the forest of Limousin, and after his prayers granted the queen of the Franks a male child was granted lands at Noblac, outside Limoges, where he founded the abbey of Noblac for himself and his followers. He fell ill while travelling and died in 559, and his feast day is 6 November. There is a Swiss town with his name, Saint-Léonard is in the canton of Valais, which is dedicated to him, and it is possible that this fragment comes from a church or monastery there. MINIATURE. 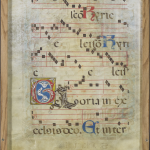 Illuminated antiphonal leaf, from a vast manuscript in Latin, on parchment. 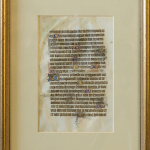 Single vast leaf, 550 mm by 395 mm., with 4 lines of text in an elaborate calligraphic hand with music in diamond-shaped notes on a 4-line red stave, a single calligraphic initial touched in yellow wash, other initials in colours enclosing sprays of foliage, one very large initial ‘K’ in highly burnished gold on deep blue grounds enclosing realistic sprigs of flowers with a full ‘frame’ decorated border in same with thick gold bands on innermost and outermost edges and gold acanthus-leaf sprays at corners and midpoints of frame, direction of relevant reading for 5 October: “S. Placidi” in main hand at foot of page. Excellent condition. 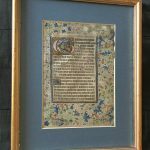 This is a visually striking example of late illumination in an excellent state of preservation. Parallels for the style of the sumptuous decoration here can be found as far back as the early sixteenth century (cf. R. Watson, Victoria and Albert Museum. Western Illuminated Manuscripts, II, 2011, no. 142, dated c. 1510-1520, especially illustration on p. 758; and no. 157, dated 1500-1515), other features here such as the form of the smaller red initial (cf. ibid, no. 173, dated 1565-1575) suggest a date late in that century. MINIATURE. Leaves from a Book of Hours in Latin, illuminated manuscript on parchment. Six single leaves (ca. 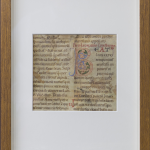 18×13 cm; 26×21 cm framed and glazed), plus one double leaf framed separately (31×24 cm), with 22 lines in a fine gothic bookhand with readings from the monastic offices for the various liturgical hours of the day. 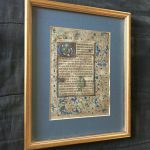 Five leaves (including the double leaf) with small initials in blue or liquid gold with contrasting red or black penwork; 3 leaves with larger initials in colour on gold grounds enclosing vividly coloured foliate sprays, the text enclosed within with gold and coloured text bars, border decoration of coloured swirls of acanthus leaves and single hairline foliage terminating in a wealth of painted flowers and golden leaves. 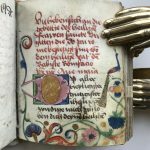 These are leaves from perhaps the most fundamental and popular type of book produced during the Middle Ages: the Book of Hours. During the fourteenth century, the explosion of wealth and piety pushed the affluent secular classes to adopt the monastic liturgical hours – certain hours of the day which began with recitations of prayers and parts of the liturgy predominantly in Latin – and ever increasingly opulent copies of these texts were produced for secular patrons to keep with them at all times and to use when the local church or monastery chimed the correct hour. 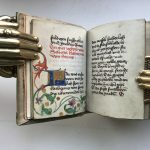 By the time of the production of this copy gold was frequently used to catch the light as the reader turned the book in his hands and heighten the visual impact of the page. MINIATURE. 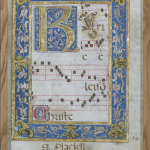 Initial ‘C’ on a cutting from an illuminated choirbook on parchment. Ca. 9 x 8 cm (framed and glazed 19 x 18 cm). A cutting with the initial ‘C’ in pink, green and blue acanthus leaf swirls, enclosing a distinctively angular and hooked white flower on a vivid blue ground, all on burnished gold ground, cut to edge. Excellent condition. 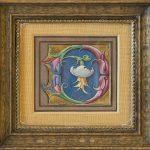 The strange angular twists to the edge of the leaves and flower petals here are startling distinctive, and find close parallels in foliage painted into the borders of two historiated initials from a series of choirbooks commissioned by Pope Pius V (reigned 1566-1572) for the Dominican convent of Santa Croce in his native town of Bosco Marengo, near Aleessandria. These historiated initials have been discussed most fully by Pia Palladino, (Treasures of a Lost Art, 2003, nos. 87a-b, pp. 18 172-174), and have been identified by S. Pettenati (Grandi Pittori per Piccole Immagini nella Corte Pontificia del ‘500. I corali miniati di San Pio V, 1998, pp. 93-94) as strongly influenced by the work of the foremost illuminator of the papal curia, Giulio Clovio (1498-1578), executed by a team of artists and scribes working between 1567/8 and 1572 there. This cutting is quite possibly from the same dispersed set of choirbooks. MINIATURE. 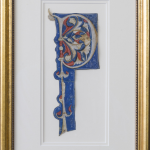 Decorated Initial ‘P’ on a cutting from an illuminated choirbook on parchment. Ca. 25×10 cm (framed and glazed 43×28 cm). Long, tall and thin decorated initial “P” enclosing an exquisite penwork human face, (perhaps an oblate of a monastic community or a choirboy), on a cutting from a decorated choirbook on vellum. The shape of the initial and the use of a hot-red colour might also suggest Siena (cf. 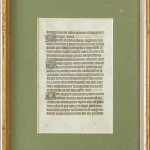 the Gradual leaf now in the Getty Museum: T. Kren and K. Barstowe, Italian Illuminated Manuscripts in the J. Paul Getty Museum, 2005, illustrated on p. 9), but the curling foliage here also shows a strong affinity with the work of Bologna in the same period (see ibid. pp. 10-11). 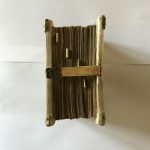 While Italian cuttings are common on the market, those as early as the fourteenth century are rare, and those of the thirteenth century exceedingly so, and are keenly sought after by the market. Single long cutting, trimmed to edges of initial, the initial in fawn bands edged with scalloping acanthus leaves, red baubels set with body of initial and mirrored sprays of red acanthus leaves emerging from descender, all enclosing riotous sprays of angular acanthus leaf foliage in fawn, dark blue and hot red, the interstitial space in right-hand of compartment with a detailed human face picked out in penwork on fawn grounds (a youth with thin features dressed in white robes, and thus perhaps one of the original singers from the parent volume: either an oblate of a monastic community or a choirboy), the whole on wide dark blue grounds with scrolling white penwork 8often forming double parallel lines), some damage to foot and traces of having once had descender folded over on itself, else in good condition. A fine and remarkably early example of Italian medieval illumination, with elements of its decoration (the style of the white penwork, and hot red palette, among others) suggesting that the artist was the Master of Bagnacavello (active late thirteenth century). He is otherwise known from a series of cuttings taken from the choirbooks of Imola Cathedral (New York, Metropolitan Museum, 26.159.1 & 26.159.2, and probably also that sold from F.G. Zeileis collection by Koller, Zurich, 18 September 2015, lot 101), and this may be a missing cutting from that group. 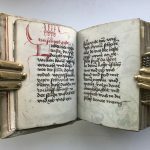 Provenance: From the collection of Roy Davids (1943-2017), former head of the Book Department at Sotheby’s. PATENT OF NOBILITY. 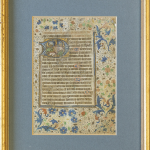 Illuminated Manuscript in Spanish. 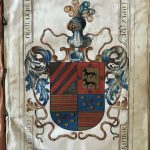 [ZOZAYA, ARANIBAR, TOPALDA, YRISARRY families:] Patent of nobility issued by Joseph Alfonso de Guerra y Villegas, King of Arms to Philip V of Spain, in favour of Don Joseph de Zozaya y Aranibar. Ca. 31×21 cm. 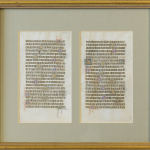 Illuminated manuscript on vellum and laid paper, in Spanish, written in neat cursive hand in black ink, 21 lines, recto and verso. Two full-page miniatures in colours and gold showing the arms of families of Zozaya, Aranibar, Topalda, and Yrisarry; one page of decorative penwork incorporating name of the King of Arms and stamped royal seal. 21 leaves, including 4 paper. 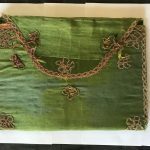 Contemporary wallet binding of embroidered green silk backed with paper, some fraying at edges, front cover partly discoloured, tears in paper backing; some stains on miniatures and in text, title loose. 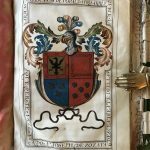 [REGUILON family:] Patent of Nobility issued by Philip V, King of Spain, in favour of Francisco Juan Gaitan Reguilon and Franciso Reguilon y Cuevas. Ca. 30.3×19.5 cm. 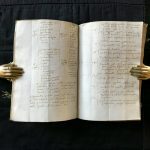 Manuscript on vellum, in Spanish, 200 leaves (including 20 final blanks), 23 or 24 lines, written in black ink in Italic hand, each page framed with red and black rules, the inkstamped armorial seal of Philip V and a notary’s endorsement in the lower margin of each recto, 12 179 historiated initials, of four or five lines, each consisting of a gold capital superimposed on a scene with a landscape or figure, eight large historiated initials, each accompanied by three or four lines of text in gold capitals on alternating red or blue grounds, 58 additional single lines of gold capitals on red or blue grounds introducing sections of text. 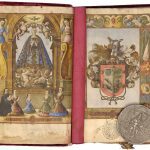 Two full-page illustrations at front, one of the Reguilon family praying before the Virgin (see description), the other the family’s armorial, with borders comprising the family motto (below), arms (at the sides), a small medallion flanked by flora (above). Original red velvet over wooden boards with large lead seal of Philip V suspended from a double cord braided of crimson, green and yellow silk; crimson silk doubles and 5 original silk interleaves (the velvet slightly worn and stained, slight worming of spine and doubles, wanting centrepiece and corner-piece bosses). 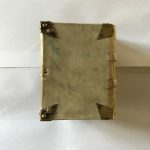 Gauffered edges, gilt. A beautifully illustrated patent of nobility, with numerous scenic and decorated initials, the frontispiece depicts members of the family in the chapel kneeling and praying before an altarpiece in which there is an image of the Virgin being lifted up to the sky and crowned by angels. The Holy Ghost oversees the scene. The image of the Virgin recalls popular Spanish devotional icons such as the famous Virgin of Atocha in Madrid. This association is relevant because Valladolid is a city near to Madrid. However, unlike the Atocha Virgin, the Virgin here is childless. Small Quarto (14.7 x 20.2 cm.). 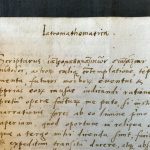 Manuscript Latin treatise on Astrological Medicine, fifty-five unnumbered pages, with three horoscopes, and several pages of argumentative diagrams and tables incorporated with the text, written in a fair hand, with no crossings-out, interlinear or marginal additions. 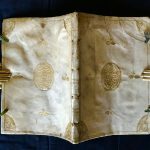 Bound in contemporary vellum (England, late C16th), ruled in gilt, with gilt italianate central medallion, decorative gilt corner-pieces incorporating flaming torches, and four gilt-stamped acorns on each cover, remains of ties, slightly creased and soiled. All edges gilt. 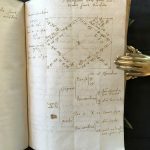 To our knowledge the most complete example of a rare treatise on astrological medicine, written in a clear secretarial hand and in an English Renaissance collector’s binding. The title is that of an ancient text by pseudo-Hermes Trismegistus, but this is a different work. 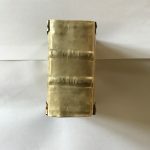 The Hermes text, originally Greek, was published in two separate sixteenth-century Latin translations, each printed several times: the present book is not a copy of either, and, although it may borrow content, it is not a new translation. Iatromathematics is defined in the introduction as “the means of revealing the properties, future instances and particular causes of sickness through contemplation of the stars and sky”. The author gives a warning from Lucretius concerning making calculations on bad scientific principles. He then explains “What to look for in the heavens the illness might be” (the text here followed by tables, referring both to body-parts and afflictions, and signs of the zodiac), “What part of the body might be infirm”, “whether or not the affliction will last”, “Whether or not [the person] will recover”, “Changes in illness, when or why they may happen, and whether they indicate good or bad things”. A study, with three horoscopes, is given of a man who was confined to his bed at 2 p.m. on June 5 1557 and died at 11 p.m. on June 14. Answers to the questions listed above are given for his case. We were provided with information at the book’s purchase, that it came from the library of Lord Delamere of Vale Royal Abbey, Cheshire. The Cholmondeley family, who had this title, inhabited 11 Vale Royal from 1615 to 1948, and lived elsewhere in Cheshire before this, but the book was possibly made for a member of a different family on account of the gilt acorns to the covers: these could well be heraldic insignia, and acorns do not appear on recorded Cholmondeley armorials. 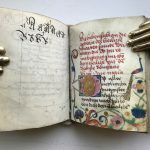 Sixteenth- to seventeenth-century English manuscript culture is increasingly recognised for its liveliness, and the present volume illustrates this. 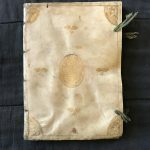 We have found one other variant example of this text, without the introduction or the horoscopes, amongst the Sloane MSS. 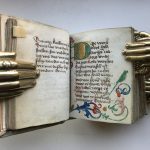 of the British Library (Sloane MS 1770 fols. 120–130), which are recognised for their importance in medical history. This other example is written in a less clearly legible working hand, from the same period as our manuscript. 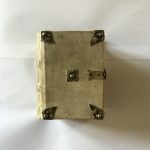 This work not in Lynn Thorndike, Pearl Kibre, Catalogue of incipits of Medieval Scientific Writings in Latin (Revised edition, Cambridge, Mass., 1963), nor Neil Ker, A.J. 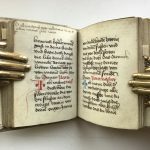 Piper, Medieval Manuscripts in British Libraries (Oxford 1969–92). Not in Julian Roberts, Andrew G. Watson, John Dee’s Library Catalogue (London 1990). 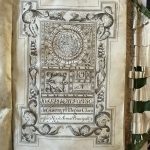 On editions of Hermes Trismegistus see Paolo Lucentini, V. Perrone Compagni, I testi e I codici de Ermete nel Medioevo (Florence 2001). 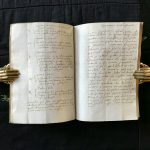 On English manuscripts see the introduction to H. R. Woudhuysen, Sir Philip Sidney and the circulation of manuscripts 1558–1640 (Oxford 1996). 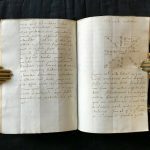 On Sloane medical manuscripts see M. A. E. Nickson, ‘Books and Manuscripts’, in Arthur MacGregor, ed., Sir Hans Sloane, Collector, Scientist, Antiquary (London 1994), 263–278, see 269. We are very grateful to Dr Sophie Page of UCL for invaluable advice and bibliography.